It’s a measure of The Show‘s innate stupidity as a movie that this notion – and all by itself – doesn’t derail things from the moment the idea is mentioned. It’s certainly the moment when the movie gives up all attempts at credibility, and settles for being an unadulterated mess. As Adam demands more and more creative control (and gets it), his insistence that the show is “real” (whatever that means), and is helping people to see that their lives can make a difference, becomes more and more nonsensical as the movie progresses. Both Adam and the script – the work of Kenny Yakkel and Noah Pink – become less and less convincing as the show, titled This Is Your Death, becomes a ratings winner, and any initial horror or disgust is conveniently overlooked. Behind the scenes, Sylvia acts as the show’s voice of conscience, but her objections to the show’s format and content is continually undermined by her remaining as the producer. Away from the show, the only other voice of dissent is provided by Adam’s sister, Karina (Callies), a nurse who quickly points out the immorality of what her brother is doing. But Adam doesn’t want to listen because Adam has his own agenda. The movie tries to keep several plot strands going all at the same time, but while some of those strands are pursued to the end, there are just as many that are maintained in such a haphazard fashion that they add to the sense that nobody working on this movie had a clear idea as to what it was actually about. Anyone looking for a movie that supports the idea of dignity through suicide will find the televised versions shown here abhorrent, while anyone looking for a cogent and thoughtful examination of what it means to sacrifice yourself for the good of your loved ones, will come away perplexed by the simplistic and lunk-headed approach that’s adopted by Yakkel and Pink’s unimpressive screenplay. There are themes and issues raised that the movie could have addressed more directly, such as the audience’s complicity in people’s deaths, and the need for each death to be as violent as possible (when someone takes their life by lethal injection, it’s something of a relief). But the movie is trying to be a thriller first and foremost, even though at best it’s a muddled drama that seeks to hurl contentious barbs at our obsession with reality television, and to a lesser extent, social media. Some of this is addressed through the character of Ilana, who wants only for the show to be successful, and who is willing to look the other way when circumstances dictate. But the character is an easy target, the network executive without a conscience, and though Janssen is a talented actress, there’s nothing she can do with the role because Ilana is a caricature without any substance. Then there’s Adam himself, increasingly arrogant, increasingly self-aggrandising, and only interested in what benefits the show can give him, from national fame on a whole different level to what he’s experienced before, to a new house that is way too big for just one person. The script tries to make it seem that Adam truly believes in what the show is trying to do, but whenever it tries to get him to explain his beliefs, they remain as unconvincing as the show as a whole. 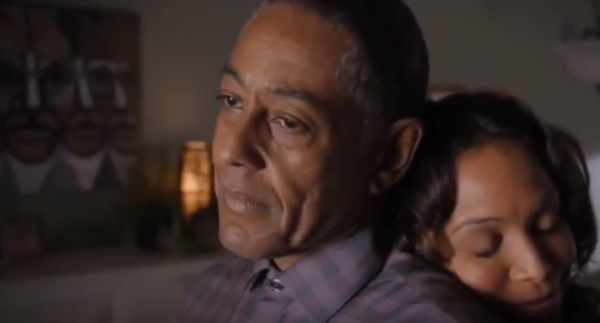 Away from the studio, the movie offers us two stories, the one that relates to Karina and her efforts to remain clean from drugs (and which you know is going to collide with the show at some stage), and the efforts of a fifty-something ex-salesman, Mason Washington (Esposito), and his efforts to keep a roof over the heads of himself and his family. Mason is working two jobs when we first meet him, but inevitably he loses both thanks to Basic Plotting 101, and when he can’t find any alternative work (and even gets turned down by a loan shark; yes, a loan shark whose conscience works better than anyone on the show), Mason begins to think about trading his life for his family’s future security. He’s the emotional core of the movie, someone we can care about and hope doesn’t kill himself, and thanks to Esposito’s sympathetic portrayal, that’s easily done. But Esposito the director still has the issue of connecting what’s essentially a character drama (Mason’s trouble finding a job etc.) with a low-concept reality TV-based thriller. Sadly, the two don’t mix as well as intended. The performances are consistent with the lack of consistency in the narrative, and the likes of Callies, FitzGerald, and Janssen can only do so much to ensure their characters aren’t completely stereotypical. 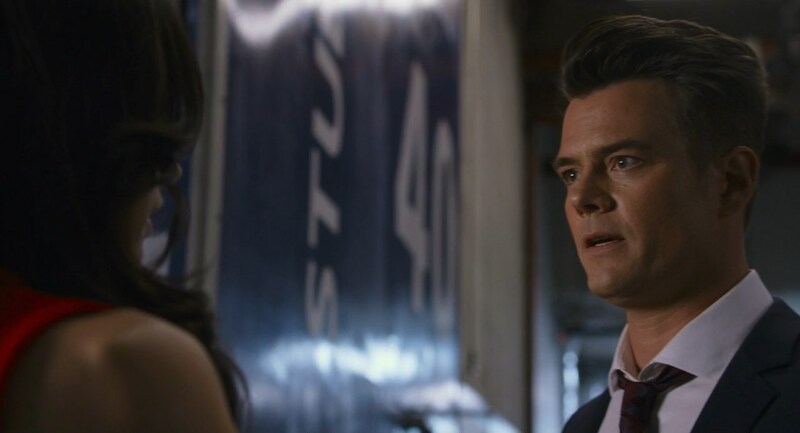 But while Esposito makes it work, Duhamel isn’t so lucky, and as he showed in Misconduct (2016), when the character isn’t fully there, he’s not always able to build on what’s available and create a compelling portrayal. 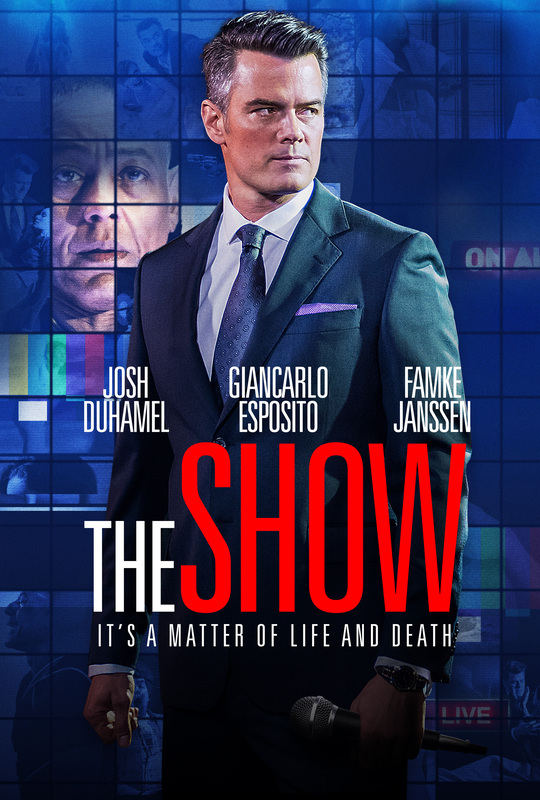 Duhamel is a likeable actor, but in this kind of movie and in this kind of role, he often seems out of his depth, and he struggles accordingly. By the end of the movie, and a scene set outside the studio, the limitations of his performance are on full display (though he’s not helped by Esposito’s clumsy direction; watch Esposito exit the scene as Mason to see just how clumsy Esposito’s direction can be). With so much that doesn’t work, or is simply under-developed, the movie coasts along trying to be relevant and/or insightful, but instead, falls down at every turn, and relies too heavily on dramatic clichés to ever achieve anything that isn’t superficial or half-baked. Rating: 3/10 – as ideas go, it’s not a bad one, but the treatment is what keeps The Show from being anything other than a jumbled, unconvincing, and embarrassing farrago; another example of a movie that feels as if everyone is working from a first draft, it plays out like a bad dream that you hope you’ll be able to forget, but which lingers in the memory just a little too long for comfort.